Skulls on spikes and poles! 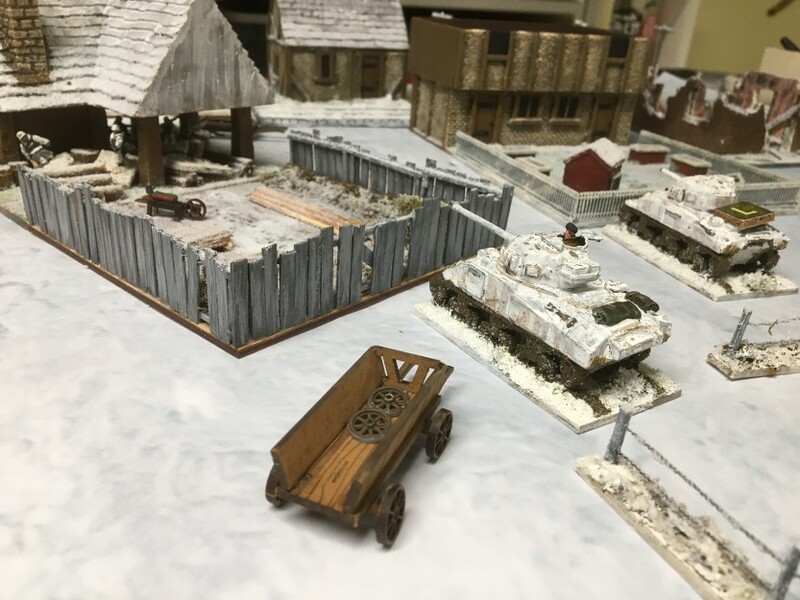 This photo-essay shows off 40 X 1/285 airplane models that I’ve worked on since fall 2017 and finally sprayed with the last shpritz of Dullcote during the most recent warm spell. I was inspired to productivity by playing in and GMing several entertaining games of Check Your 6! 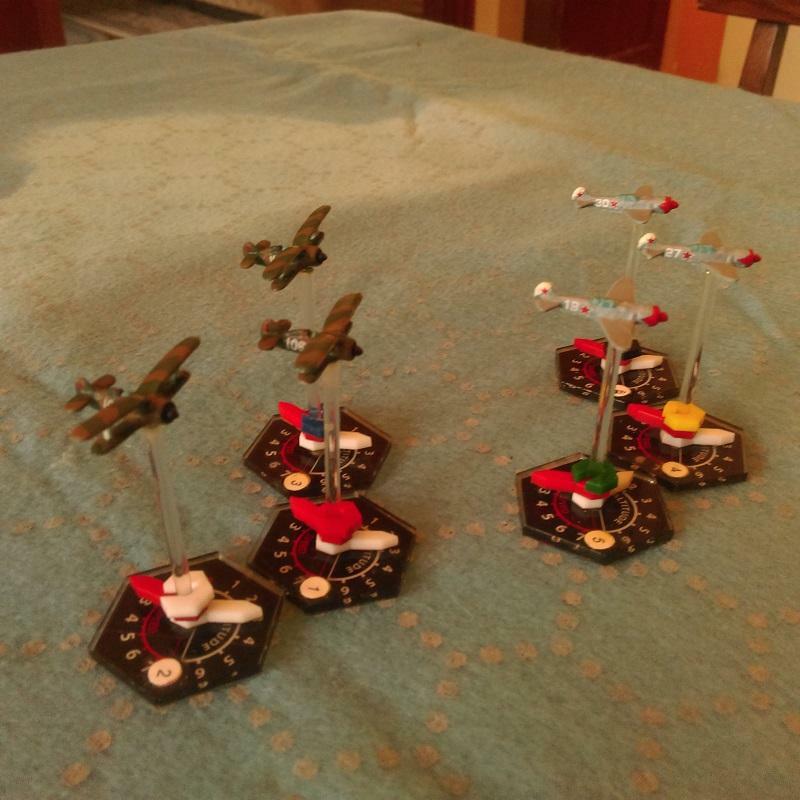 WWII air combat last year. 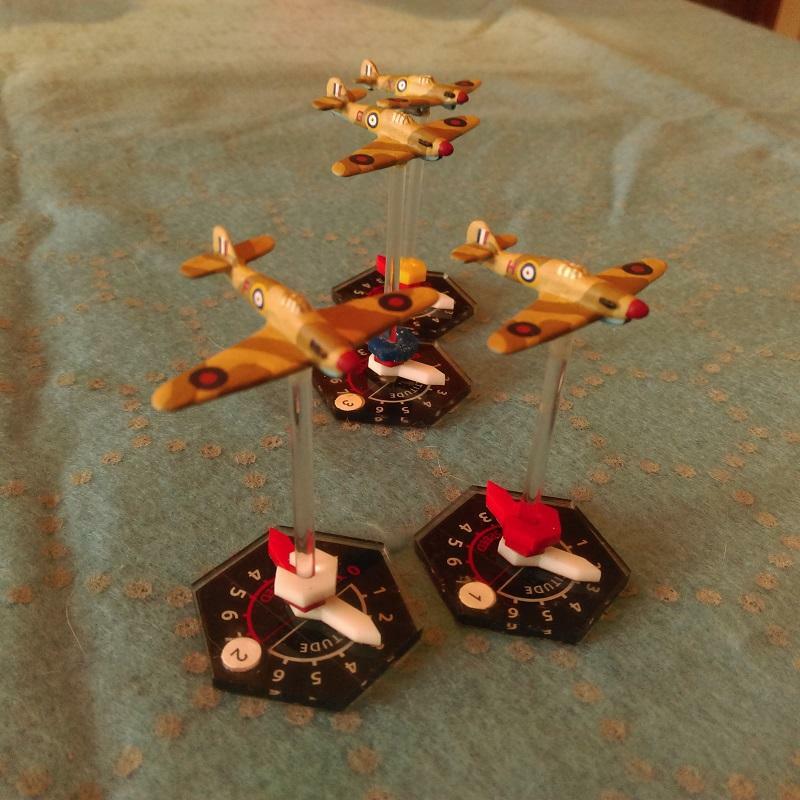 Most of these models make up the core of an RAF Desert Air Force, but you can also see my Hobby Attention Deficit Disorder at work as I hop from theater to theater, like a squirrel driven to distraction by too many acorns. 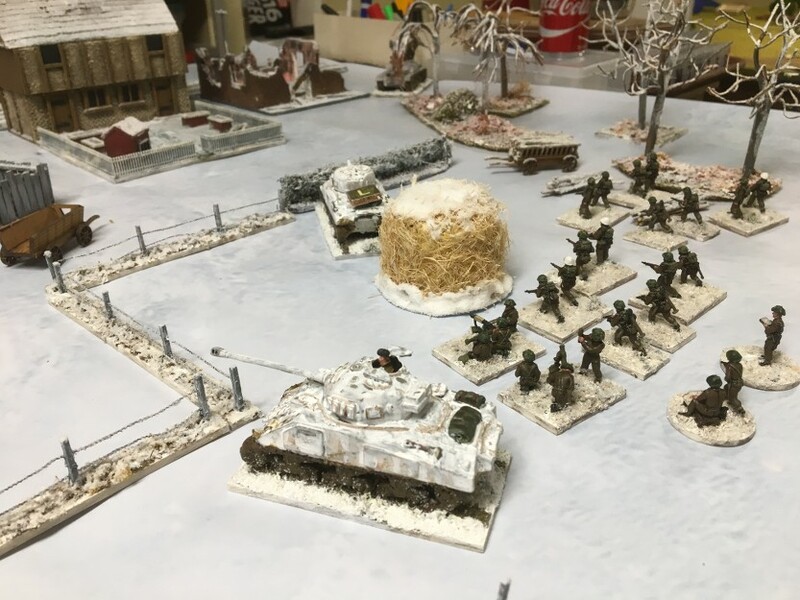 I painted all these models my very own self. 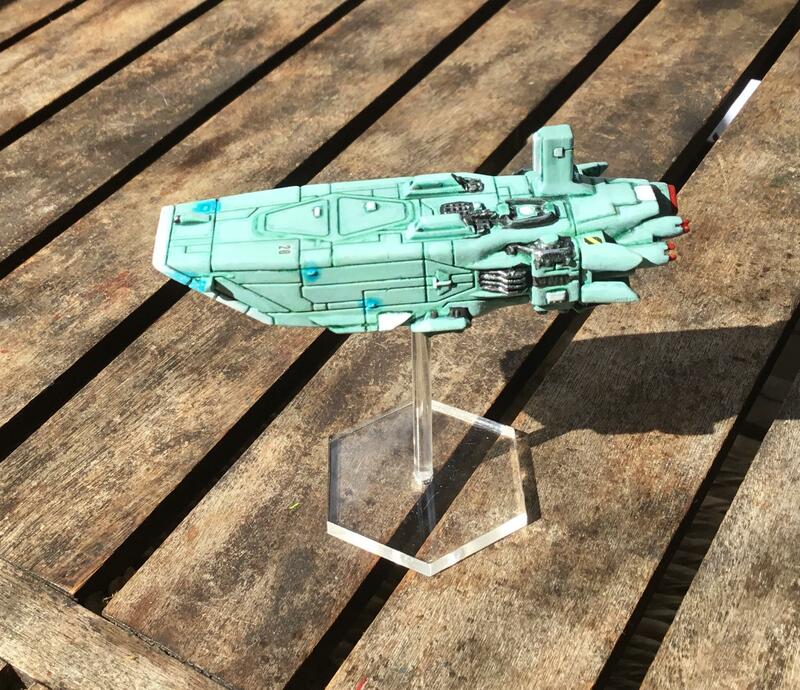 I like to paint, but I’m slooow, so I buy most of my toys painted, usually second-hand from gamers selling their collections. 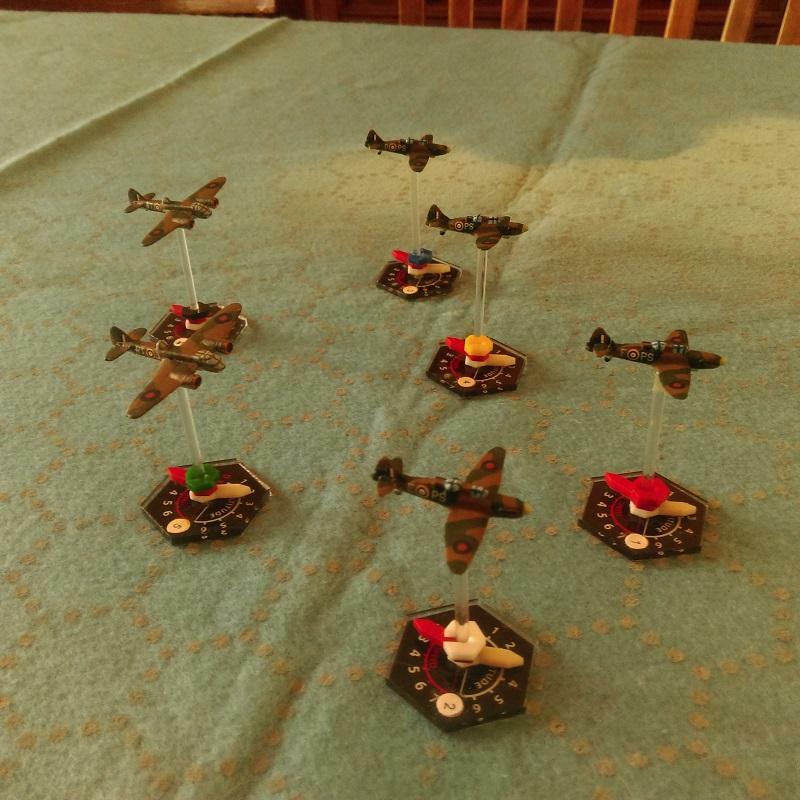 The way this works with 6mm airplanes is, some guy will sell me his 30-or-so painted models for maybe $50, and his 200 unpainted models for $20. Who could pass up such a deal? I put the painted models on the table, the unpainted go into inventory for later. Suddenly now it’s later. Another thing these photos prove is that I’ll paint any casting that comes to hand. They don’t have to be the latest and greated sculpts, they don’t have to have exactly the right silhouette, they don’t even have to match each other. Given enough time, I’ll paint ’em all. My painting style is basic block. I don’t paint panel lines or exhaust stains. I obsess on canopy frames, they take me a long time, and I go nuts with decals. Every model in these photos has between 12 and 16 individual decals applied, set and sealed. No one ever looks at the national insignia under the wings, but I know they’re there. 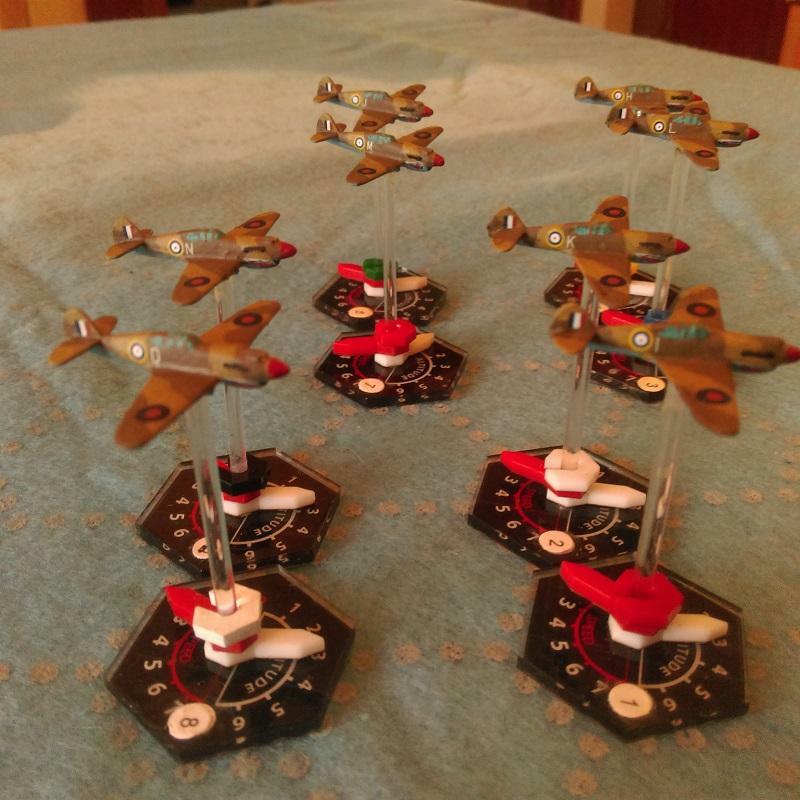 First up are half a dozen of the very best second-rate RAF fighters to round out my Battle of Britain collection, four Defiants and two Blenheim 1Fs. The Defiants are Collectair, the Blenheims I don’t know, it didn’t say on the bag. Pretty fair castings and I tried to do them justice. 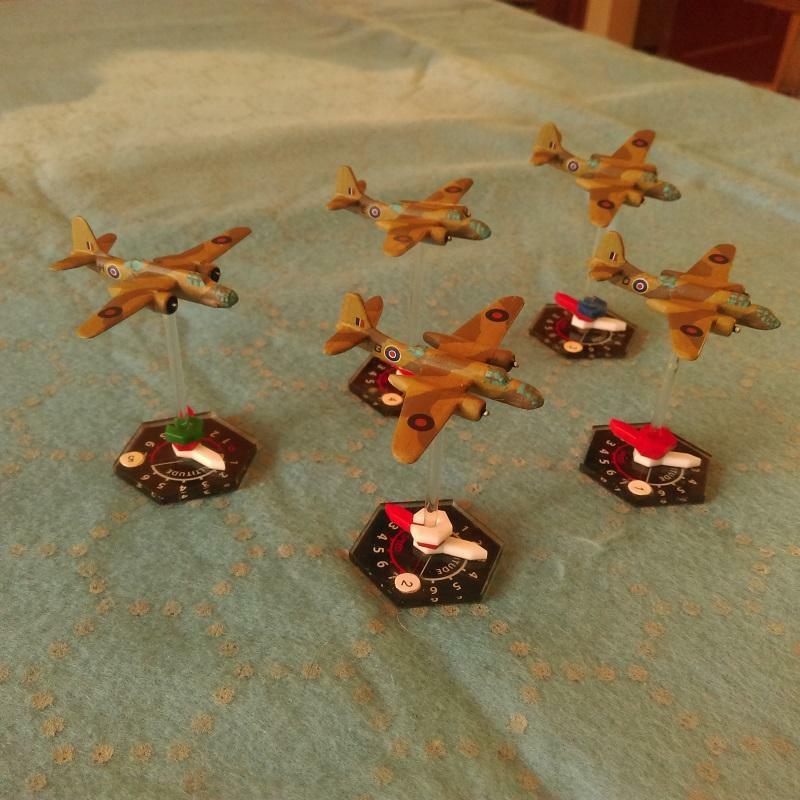 Next are four Japanese Tony fighters for SW Pacific 1943. These are Raiden models. I bought them retail, which I hardly ever do, because I really like ’em. Here are four desert Hurricanes. Three of them are Scotia Hurri Is, and the fourth, I dunno, but it matches pretty well except for the bombs under its wings. Henh. The odd one had a Vokes air filter, so I sculpted filters on the Scotias using Tamiya putty. No one will ever care but me, but it’s on my Lifetime Achievement List and now you too know that I did it. Yes, the colors are wrong. I was still figuring out the RAF Mediterranean scheme when I started this squadron and I erred, I used too light of a palette. Hi-ho. Consider them to be flying in really strong sunlight. Five Douglas Boston bombers. I got the Med cammo scheme right on these. Four of them are Croissant Miniatures, a brand I haven’t seen recently, and the fifth isn’t. Again, there was no id on the package, but it matches the others pretty well. You can pick out the strange bird if you look close. Seven Spitfire Vs. I have five more painted, but I ran out of decals. Seven are enough for now. Five of the models are Raiden and two are Scotia. You can see the difference without looking too hard. Jimmy crack corn, I do not care. The five waiting for decals are from two *other* manufacturers. One thing I did with all of the Spit Vs was drill holes in the wings and glue in bits of brass wire. 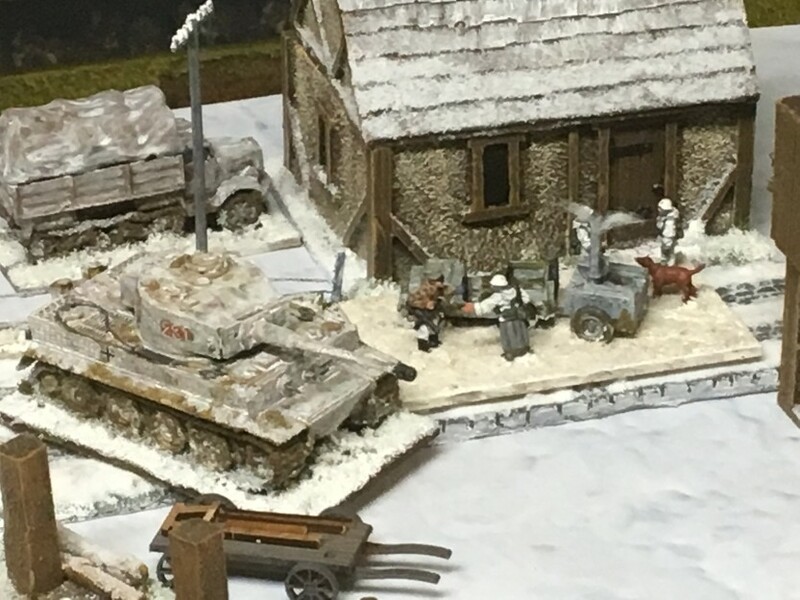 I may have done more harm than good, but I need to see those 20mm cannon tubes on a Spitfire V.
Eight Tomahawks, Raidens, that I bought new because I really like the sculpts. I moved them to the front of the queue and painted them because I like them that much. 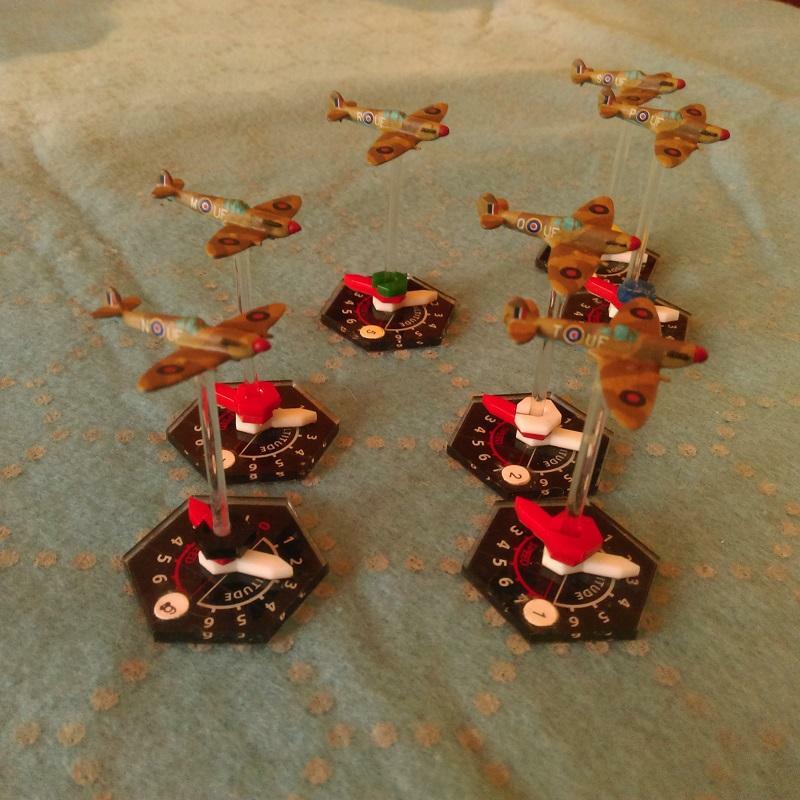 I think I’ll buy eight more and paint them as Flying Tigers. They’re great sculpts. Last, some Russians, because a friend wants to do East Front. Acorn! These are a bit of a cheat. 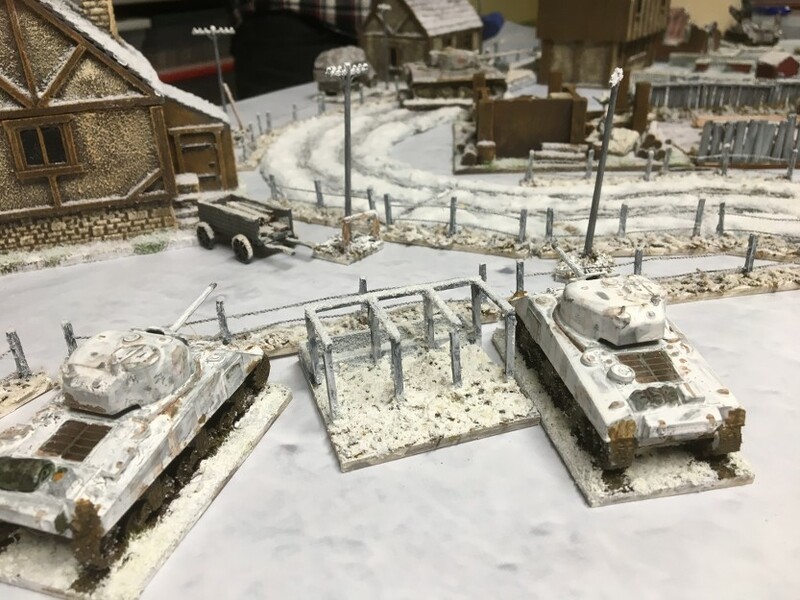 I bought them second-hand with a ragged, worn, base-coat on them, but I applied all the paint you can see on them now, and the decals, and the sealer. Three I-153s are Scotia models. Three La 7s…might be Scotias, too. Most of the models I got from this guy were Scotias. 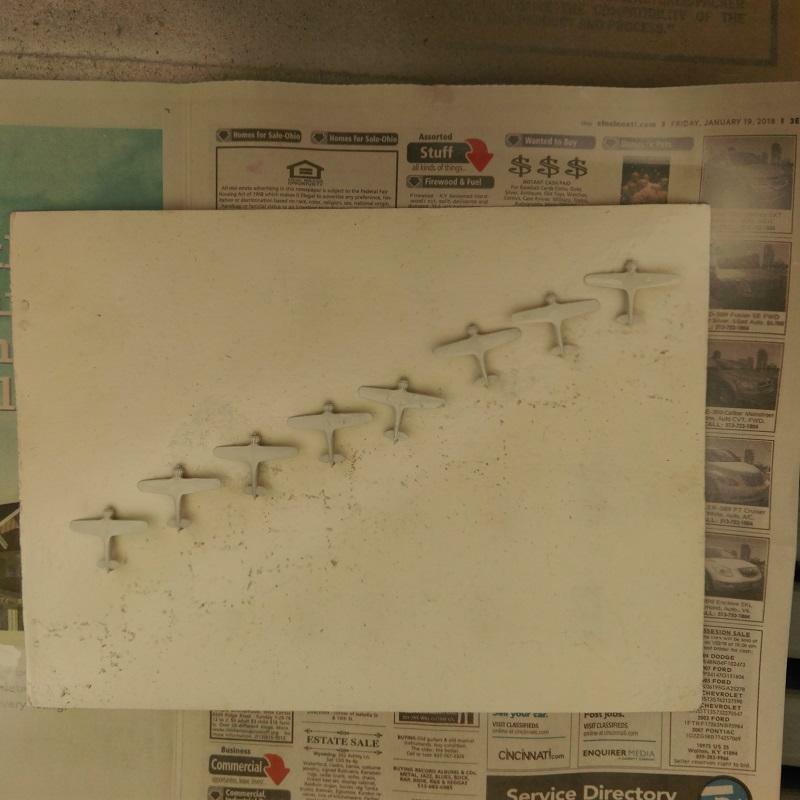 Currently on the painting table (among other things): about 50 X 6mm Italian planes, to fly against my Desert Air Force. 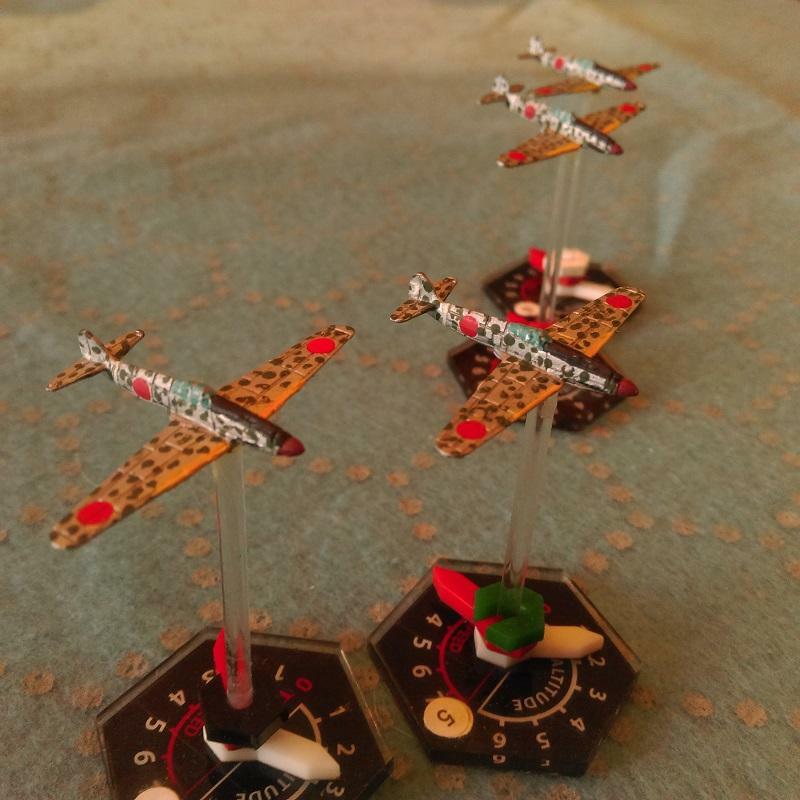 I have a few Luftwaffe planes in desert scheme done and I’ll paint more, but I want bags and bags of Italians. I’m cleaning and puttying the models (most of them have surface pitting issues, but I’ll work with that), and plan to prime them come spring. Trees lots and lots of trees with some 15mm Barbarians and Pike and Shotte. Finishing Kushites, then onto re-organizing Neapolitan Spanish then some Parthians to paint. A band of Kern for me, just finished these ones from QRF. I added the shields. Hi, new to this site seems friendly enough. 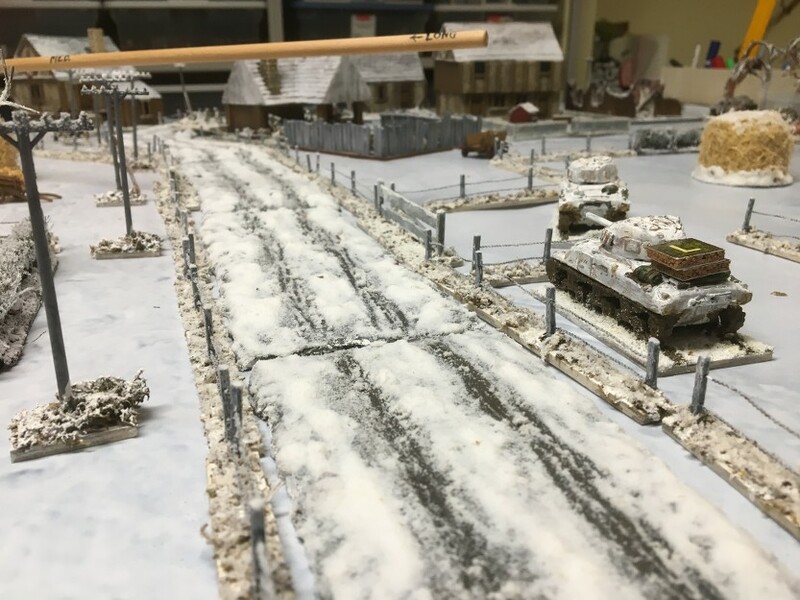 I’m making a Black Hawk Down game, it was for a demo game at Plymouth show in February, but due to dates clashing can`t make it. 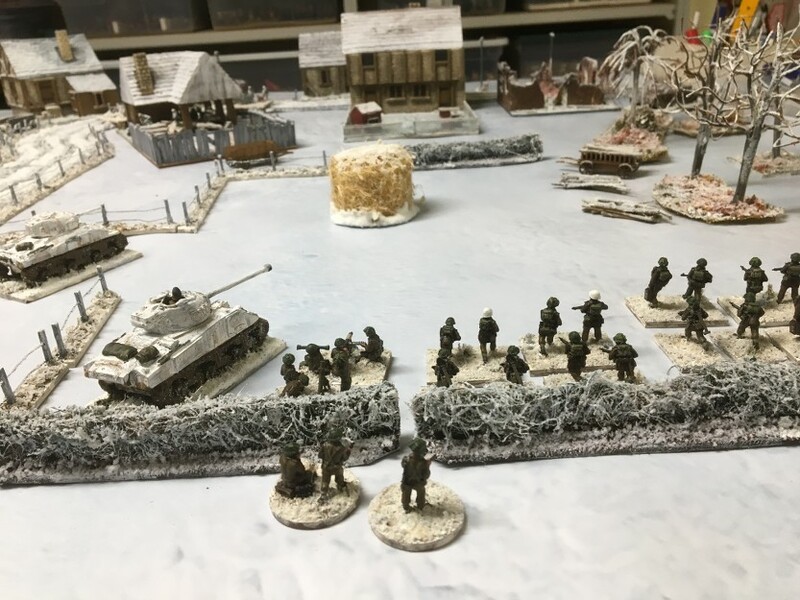 Decided to do it in 20mm and buy plastic figures. The Caesar militia were fine but the Mars box of modern U.S were horrendous two sprues had like caught the edge of the mould. Boy what a mess. I’m making a UH-60 and bought a box of the li’l birds, surprised me to find had two kits in the box. Some 6mm WW2 infantry in order to get my Battlegroup rules some actual use. 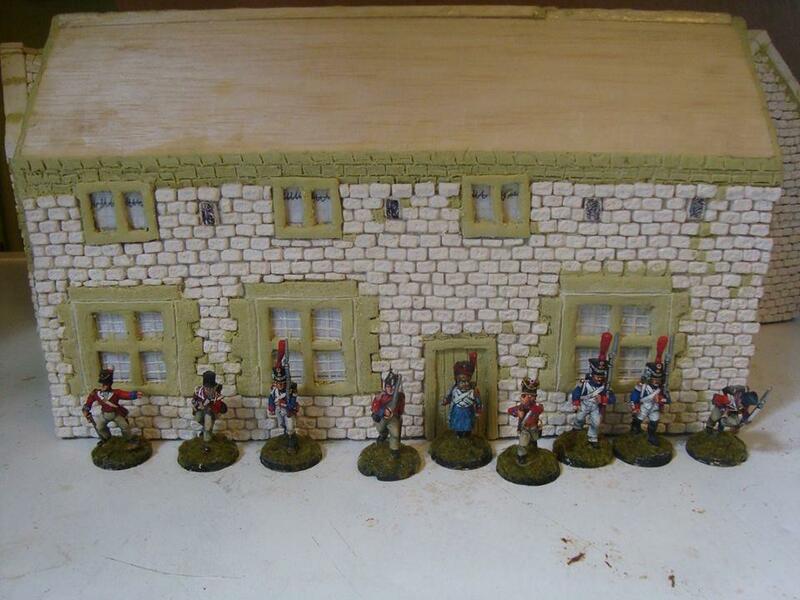 Quick shot of some 6mm ACW Leven Miniatures I am working on for a client. Ruddy loads! 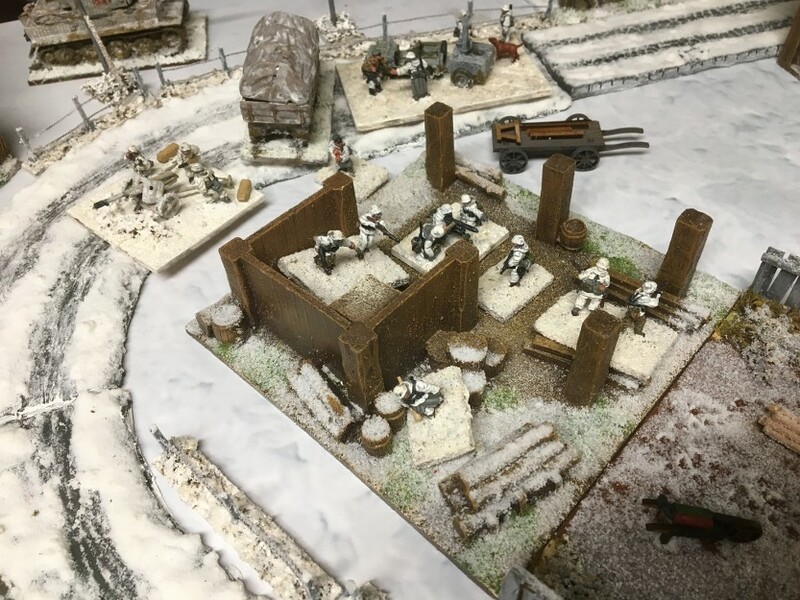 Models from Darkest Star Games, Brigade and some Mecha Front walkers. Plus a 28mm big stompy robot. 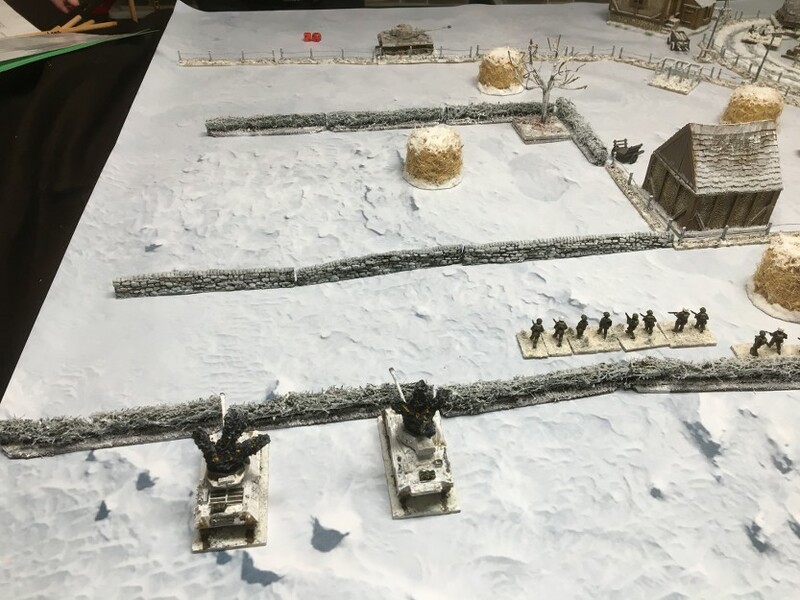 Carlists for me, mountain guns and a battalion of infantry. 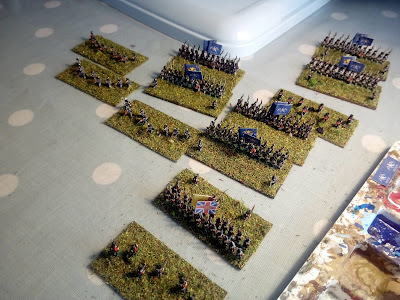 I mostly play and paint 15mm historicals; sometimes find time for 28(+)mm skirmish games, e.g. Malifaux, Infinity, SoBaH. 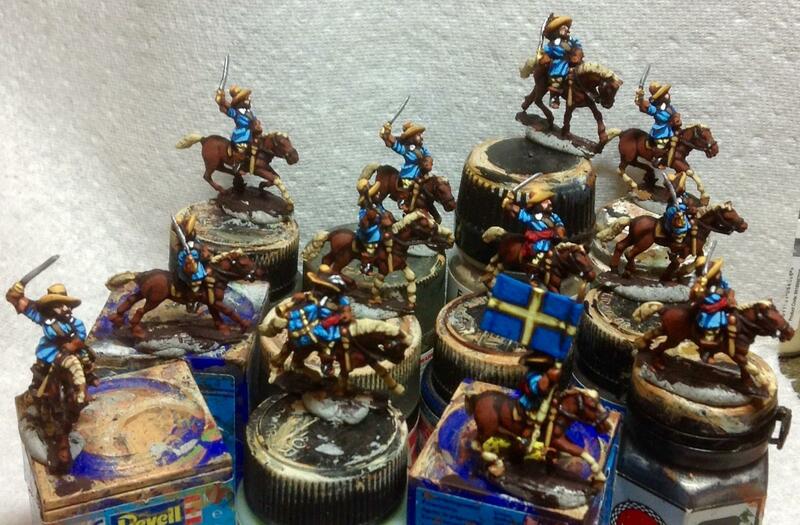 Reminds me, I have some 10mm Assyrians waiting to be finished somewhere! 15 PCS T-55AM’s for my East Germans. 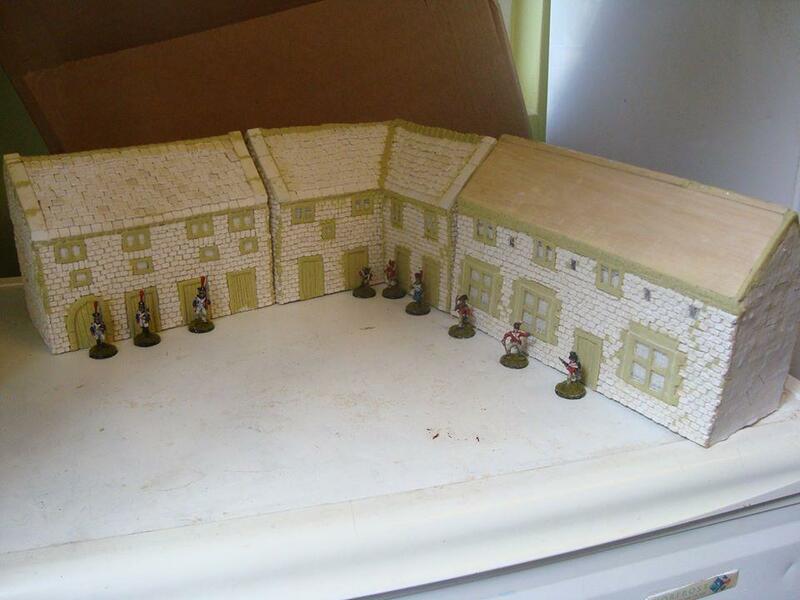 I am awaiting the arrival of a parcel from Baccus with lots of new Scots Covenanter foot in it. 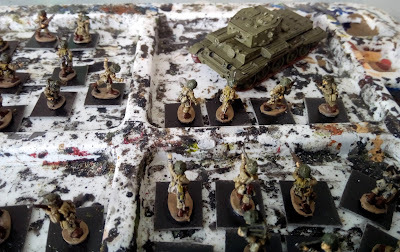 Last weekend, I decided to start eliminating the little packages that were piling up on my painting table, so right now, I’ve got paint on 4x QRF GAZ66s, and a half dozen assorted 28mm scavengers for the post apocalypse. 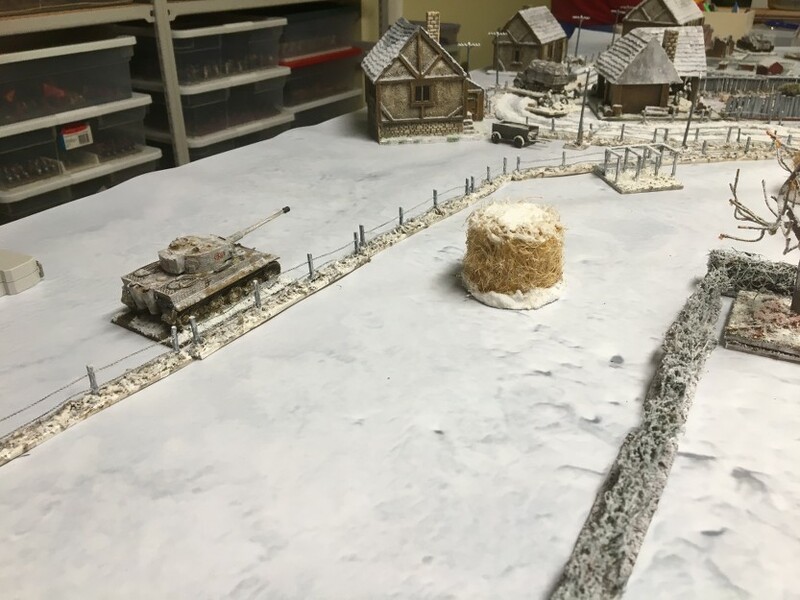 Additionally, there are 80 or so 15mm East Germans and another 30+ modern FFL based and primed, waiting for paint. Colonel Wynne’s Dragoons above and Lord Abercorn’s Horse below. 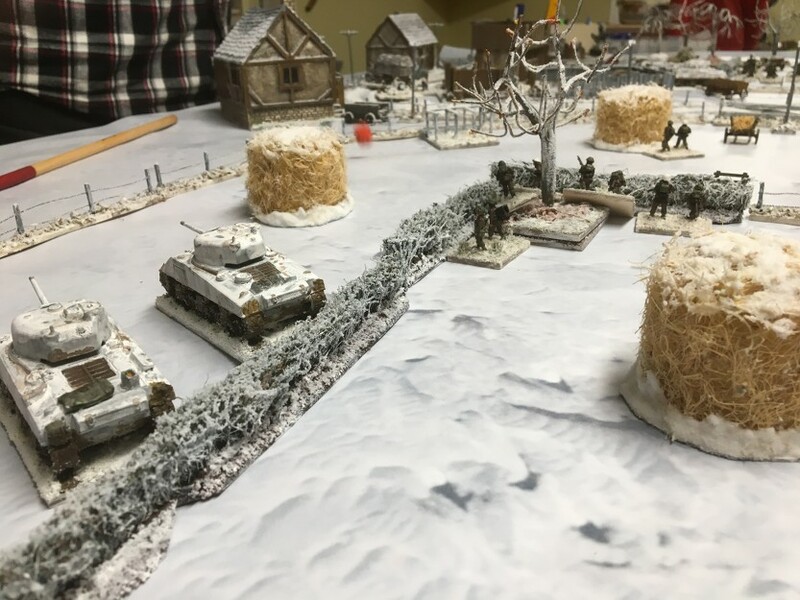 Both ready for action in the War of The Three Kings. The Williamite Dragoons are from Irregular and the Jacobite Horse are from Essex-an excellent fit in size and style. A Star Wars New Order landing craft that I picked up for three dollars, being repurposed as a 3mm Spesss Mahrine transport. This reply was modified 11 months, 1 week ago by Thaddeus Blanchette. My oldest Grand Son has moved in with us, so I have lost my hobby room and now everything is piled up in the garage…good thing I love my Grand Kids. Museum Miniatures 15mm mediaeval spearmen. The Imperial Guard and the spearmen have slots to fill in armies, but I got rid of my 28mm ECW stuff ages ago, so these will probably end up on Ebay. Ah well. This reply was modified 6 months, 1 week ago by Guy Farrish. 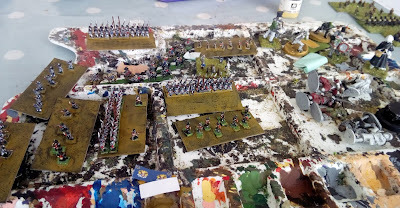 I have a new-ish game room and painting some Eastern Woodland Indians for French and Indian Wars. This reply was modified 6 months, 1 week ago by Jim Jackaman. Going to end up with a fair few of those, I got one of their bargain bags so it’s a division sized force supplemented by some Perry figures. Or it will be when it’s finished. I know like me you are a Warrior fan so I’ll post a pic of the whole lot once done. 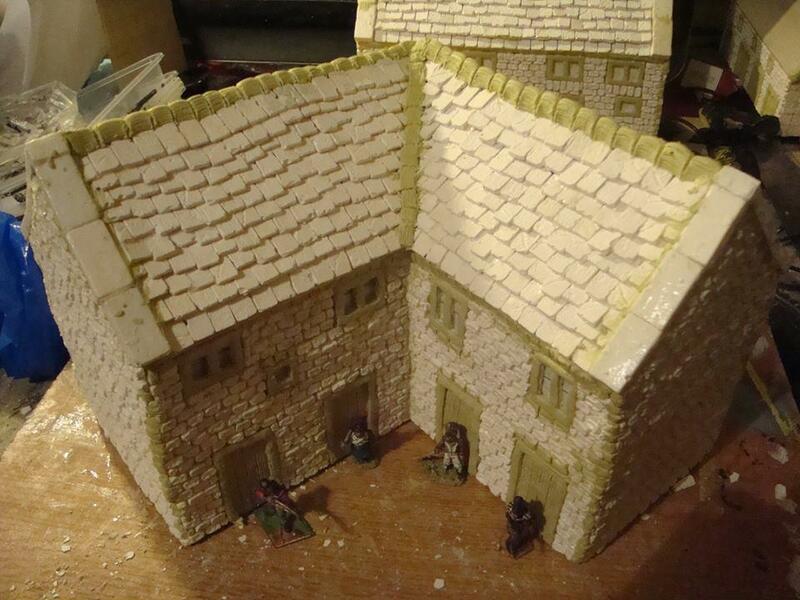 On the painting desk, is the new buildings in process sculpturing 28mm la haye sainte farm. the longest project I have ever worked on. cant wait to get the moulds done and get these painted up. 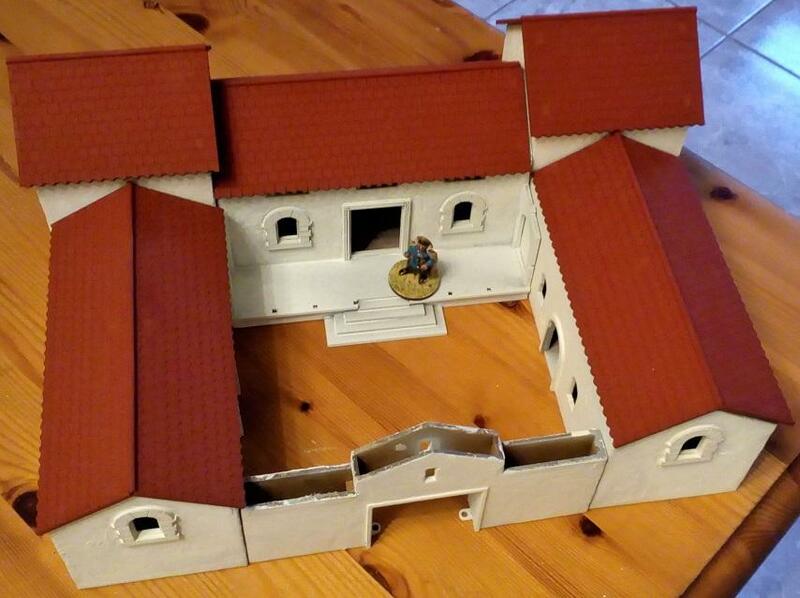 Getting some Middle Period Simurgh buildings painted. 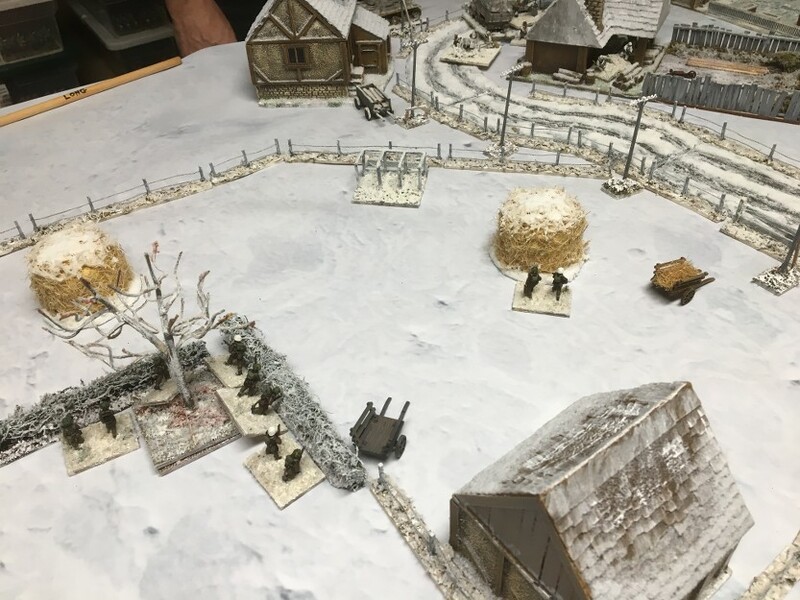 Finally finished my WW2 Winter game. With a play test recently. 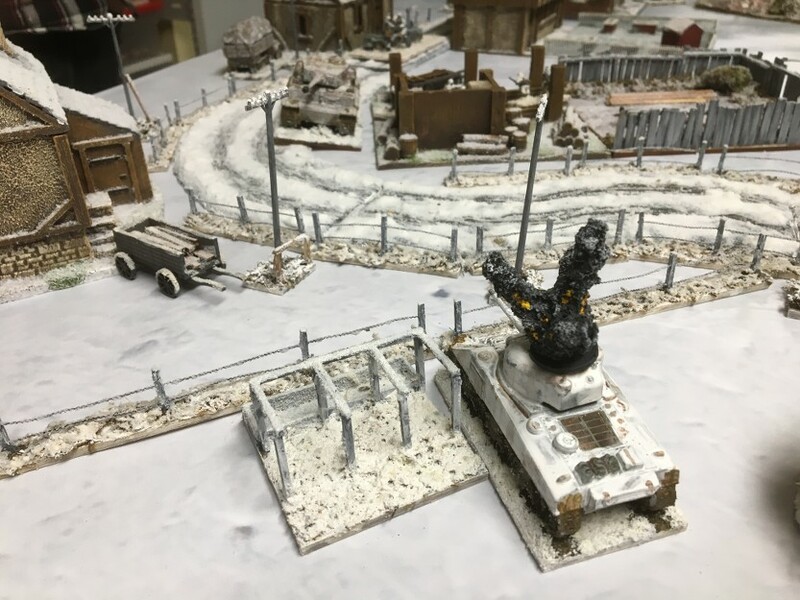 That’s a lovely set up!